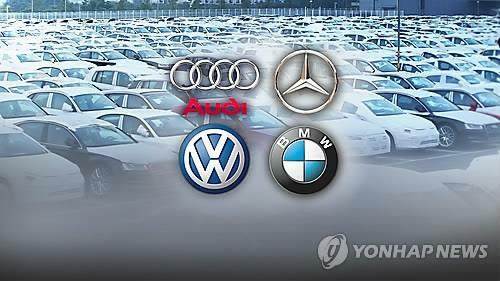 SEOUL, Nov. 6 (Yonhap) — A record number of foreign car brands are expected to sell more than 10,000 units in South Korea in 2018 on their growing popularity among local motorists, industry sources said Tuesday. Given track records during the first 10 months of the year, up to nine foreign car marques are projected to join the “10,000-unit sales club” this year, up from seven last year, according to the sources. Last year, Mercedes-Benz, BMW, Toyota, Lexus, Landrover, Ford and Honda sold more than 10,000 vehicles in the domestic market. The 10,000-car club is widely seen as a yardstick of a foreign automaker’s successful entry into the South Korean market. In the January-October period of this year, six foreign carmakers already sold more than 10,000 units here, with Mercedes-Benz emerging as the top seller. Mercedes-Benz sold the most units at 57,117, followed by BMW with 45,093, Toyota with 13,268, Volkswagen with 12,294 and Audi with 11,261. Landrover came next with sales of 10,356 units. Ford and Lexus are tipped to make the list as they sold 9,880 vehicles and 9,870 units, respectively, during the 10-month period. Market watchers said MINI, which sold 9,562 units last year, may join the 10,000-car club this year as its sales stood at 7,986 units in the first 10 months. Foreign car brands have been gaining popularity among local consumers. In October, imported vehicle sales soared 24 percent on-year to 20,813 units, according to industry data.